Sometimes, when a person is getting to know me, I am asked if there is anything about England I miss. It used to be the beer, but with the changes in American brewing, I now can get cask-conditioned ale as good as the barrels of home brew drawn from the mash that I made in my Spalding, Lincs days. There is a second, that is now in first place – Bicycling. I didn’t own a car for 14 of the 16 years I lived in England and got around 99% of the time by bicycle. There was a time when I had a graduated triple – myself on the front and my two sons as stokers behind me. That bicycle always slowed traffic and turned heads in smiles. I think my youngest spent more time with his legs up enjoying the ride at the back! We sure got some speed going on it. I also had a second-hand sport bicycle for exercise. I used to pull out the spandex and water bottles, head off on a predetermined route – checking always for the wind conditions – and turned midway with a great pub for a pause and a pint in the shade. Odd, I never did lose any weight. But my old reliable workhorse among the fens of southeastern Lincolnshire and around the streets of Grimsby was a wonderful 1953 Triumph men’s bicycle. I found the old brochure online. 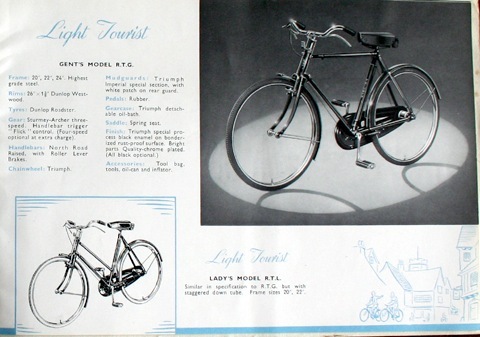 There was a hub generator (Eng: dynamo) on the rear wheel for the front and rear lights and a back luggage rack that is missing in the catalogue photograph. That bicycle was indestructible and went with me in all weathers 365 days a year. Up mud-spattered farm tracks in February, down the sea-front in a gale that peppered one side of my clothing and woolen hat with sand so I looked like a half-bedouin after a bad day in the desert. I had spats, waterproof jacket and trousers, special gloves and shoes. My vestments and books on the rack or in a shouldered back pack. I would always pull the old fella up into the church with me under the clouded look of a church warden or verger. But there were wonderful days on the Triumph as well. Some of my fondest memories were cycling between villages on a gorgeous spring day; a distant church tower in my sights as destination, a gentle breeze at my back with a huge cloudless sky that only the fens give you and vast fields of yellow daffodils. The fields punctuated here and there with a distant car on a road at right angles to mine, looking almost as if it were gliding on the tops of the blossoms like a sailboat. Perhaps there might be a skylark singing their heart out as it slowly ascended to a small dot high in the sky. Only its song and the gentle “tick-tick” of the Sturmey-Archer hub as sound. Of course, bicycle manufacturing that my Triumph represented have disappeared from England and the States long ago – any old Schwinns out there? Taiwan, China and India are the countries that make them now. I have thought about finding a way to order one from India where the old design is still made, but nostalgia being what it is, it is best left to memory. As a testimony to those days when my old Triumph was born, enjoy this British Council Film on how a Bicycle is Made. Did I mention that my retirement present to myself, if Lord willing I get that far and the money is there, is a recumbent tricycle? Previous Post Should Priests Ever Walk Away?